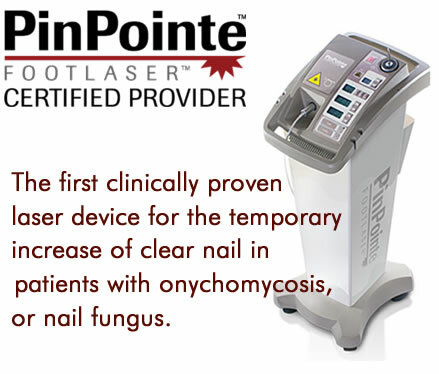 The PinPointe FootLaser kills the fungus that lives in and under the toenail. The laser light passes through the toenail without causing damage to the nail or the surrounding skin. At the time of the procedure, the toenail will not become instantly clear - it takes time to grow out. They can expect a consultation with you explaining the procedure to be performed and any follow-up visits you prescribe. Can the patient expect more than one treatment? One treatment kills the fungus for most patients. You will determine if the patient needs follow-up care. Most patients feel no pain. Some may feel a warming sensation and very few feel a pinprick. No; just walk in and walk out. The Footlaser procedure takes less than 30 minutes. The fungus is killed after one treatment, and typically you can recommend care techniques to reduce a recurrence of the infection. There is a chance of reinfection because the fungus is present everywhere in the environment. When can your patient paint their nails or have a pedicure? They can apply polish immediately after the treatment. It is important to inform the patient that they should remove all nail polish and nail decorations the day before their treatment. What kind of payments can I accept for the procedure? Credit cards, cash, money orders can be accepted. The patient may also use their Medical IRA, Health Savings or Flexible Spending Accounts. Can the procedure be covered by their insurance? If they have a Health Savings Account or Medical IRA, 100% of cost can be covered. However, in most situations, this procedure is considered aesthetic, and therefore health insurance plans do not provide coverage. Clinical studies began in November 2007 demonstrating over an 88% success rate. Yes, it is cleared by the FDA. Leading scientists and medical professionals working together for 20 years with funding provided by the National Institutes of Health developed the technology in the patented PinPointe FootLaser.